Japan has released the Economy Watchers Sentiment, Average Cash Earnings y/y, Final GDP Price Index y/y and Final GDP q/q data and the US will publish Final Wholesale Inventories m/m, Prelim UoM Consumer Sentiment, Unemployment Rate, Non-Farm Employment Change and Average Hourly Earnings m/m. 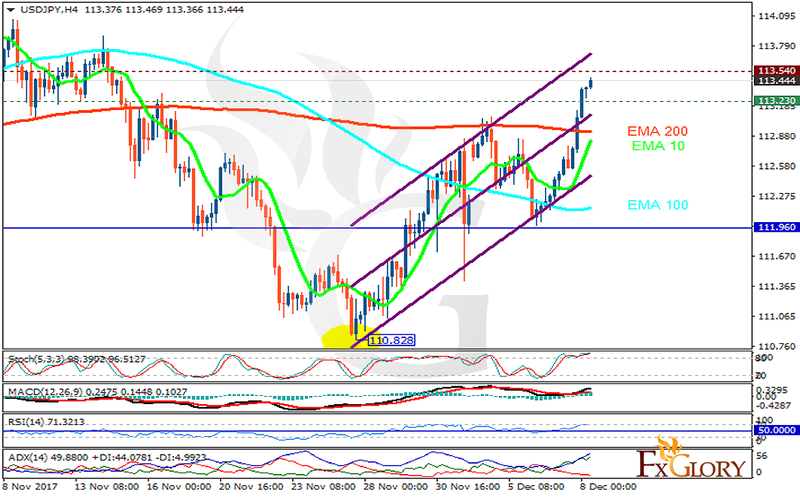 The support rests at 113.230 with resistance at 113.540 which both lines are above the weekly pivot point at 111.960. The EMA of 10 is moving with bullish bias in the ascendant channel and it is below the EMA of 200 and above the EMA of 100. The RSI is moving above the overbought area, the Stochastic is moving in high ranges and the MACD line is above the signal line in the positive territory. The ADX is showing buy signals.